Will Trump Cut Social Security Benefits? Subject: Will Trump Cut Social Security Benefits? Will Trump cut Social Security benefits? That's the big question keeping more than 46 million U.S. baby boomers up at night following the election of Donald Trump. 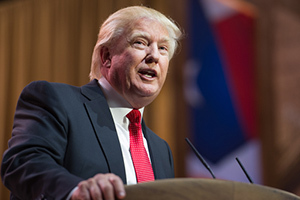 The 45th president of the United States pledged during his campaign to protect Social Security and maintain current Medicare programs when he takes the Oval Office in 2017. "We're not going to hurt the people who have been paying into Social Security their whole life," Trump stated during his campaign. He said the payment of promised benefits amounts to "honoring a deal." The Republican president-elect said his plans to increase economic growth will take care of any long-term Social Security problems. Trump has vowed to spend $1 trillion on infrastructure, reduce regulations plaguing the financial sector, and overhaul taxes. A recent Wall Street Journal survey of economists suggests Trump's "proposals to reduce taxes and invest in infrastructure will amount to a substantial fiscal stimulus." Barclays hiked its projections for 2017 growth in large part because of Trump's promised tax cuts. Before the Nov. 8 election, the consensus view among economists was that 2% GDP growth was the best-case scenario for the foreseeable future. The overwhelming consensus was the United States was mired in a slow-growth world and that the heyday of 3%-plus growth was a thing of the past. Still, many are skeptical if Social Security recipients can avoid a reduction in benefits or an increase in taxes. Some even worry if Social Security will survive. To date, Trump has not shared much about his Social Security plan. That has a lot of people worried, despite his campaign pledges. Will Trump Cut Social Security Benefits or Protect Them?